The 168 F/C (Fish & Cruise) is spanking new for 2010 and is the smallest pontoon boat in the G3 lineup. That said, it makes available 128 square feet, almost all of it usable space. 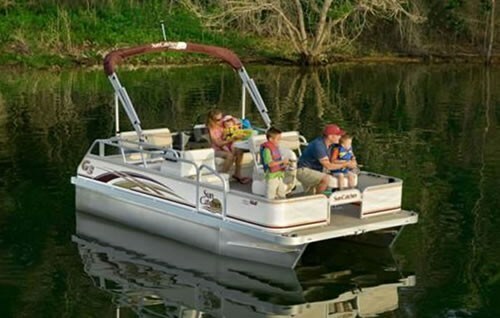 It comes well equipped for a family fun day on the water, fishing and cruising as the name implies. With more than 25 HP test power, it might even be used for tubing with smaller children. The 168 is offered in one colour only, sunset gold. The floor is carpeted and a colour matching bimini stows over the engine when not in place, protecting the occupants from UV rays. For the fishing enthusiast, it comes pre-wired for an electric trolling motor. There are no fewer than six, rod holders forward with three more beside the helm. For those who might wish to cruise quietly around their small lake or on a lake that frowns on the use of gasoline engines, another new model, the 168 F/C Electric, is available with only electric power, but with all the same features as its gasoline counterpart. Obviously, it does not come with a fuel tank, tachometer or speedometer on the dash. A MinnKota electric is factory installed. It will be very interesting to see how well this model is accepted. The Starboard centre console is equipped with a speedometer and tachometer, and a covered stereo complete with an iPod outlet and twin speakers. The helm seat is quite comfortable and all controls are easily reached. Passenger seating is very versatile (see photo). 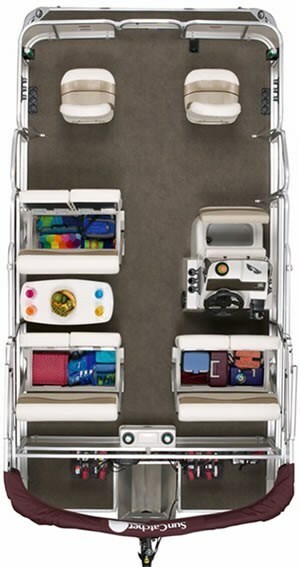 There are two double seats facing aft, with drink holders between for fishing or just lounging. Simply fold the seatbacks rearward about 30 degrees, and seating now faces forward for cruising. Portside, a dining table separates another similar reversible seat arrangement. At the bow there are two more pedestal seats. Storage below all but the two forward seats is quite adequate for a16 footer. Cruising quietly at 8 to10 MPH in this 16' pontoon boat is a very peaceful, relaxing way to pass the day, and you won't break the bank buying fuel. Steering is effortless and the pontoons tracked well in the mildly choppy conditions on test day on Lake Couchiching in Central Ontario. There is little tendency to pitch or roll nearly as much as a similar length mono-hull. It came equipped with a high-torque prop, making docking simple and reversing or stopping very positive. This is not a water skiing or rough water boat, but a family could derive a lot of on-water pleasure from this well equipped pontoon vessel that comes complete with trailer for less than $15,000. It is very easy to board and exit, and has lots of safe room for children to play or adults to fish. As equipped with a 25HP Four Stroke it is smooth and quiet but definitely not fast, having a top speed of about 15MPH. If you want to go faster it is rated to 60HP, but personally, for the difference in speed and performance, I'd stay with the 25. There is also a whole different untapped market for builders of pontoon boats that they may not be capitalizing on. There are many people out there who were avid boaters for many years and are no longer in physical condition to hop around boats the way they once did. They may simply like to just get on the water, go for a short cruise or take their grandchildren out for the day. This is a great way to accomplish those goals. Just so I'm not accused of deriding seniors, I'm speaking from personal experience!